The official registered charity of Newcastle United Football Club has formally taken ownership of a city centre building that will be transformed into a new multi-million-pound community hub. The keys for Murray House - a community centre located just a goal-kick away from St. James’ Park - were officially handed over by its committee to Newcastle United Foundation in front of 200 guests at a special event inside the current building on Thursday evening. The event was hosted by BBC Five Live’s John Murray and attendees including the leader of Newcastle City Council, Nick Forbes, Member of Parliament for Newcastle Central, Chi Onwurah MP, and Northumbria Police chief superintendent, Ged Noble – as well as Newcastle United’s managing director, Lee Charnley, and head of Newcastle United Foundation, Kate Bradley. The Foundation, which helps to improve the lives of thousands of local people each year, plans to demolish Murray House before constructing a state-of-the-art centre for sport education, health and wellbeing in its place. Detailed proposals for the new centre – dubbed Project Pitchside – have already been released and planning permission has been successfully acquired following a public consultation. A fundraising campaign is now under way to enable construction to commence, with founding donations from the Sir James’ Knott Trust, David Harrison Centre for Social Mobility and the Northstar Foundation. As part of the event on Thursday evening, business leaders from across the North East learned the scale of the economic and social impact that Newcastle United and Newcastle United Foundation continue to have on the region – including supporting over 2,000 jobs. 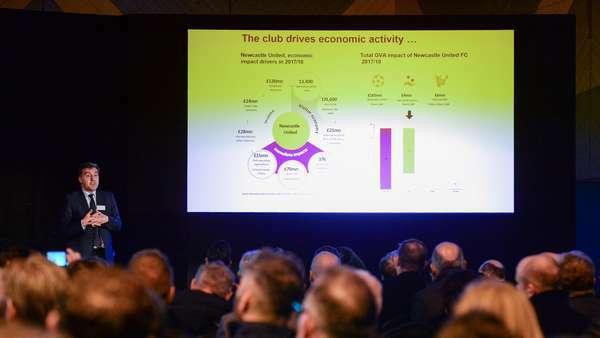 Produced by global services firm EY (Ernst & Young), the Economic and Social Impact Report was presented by its chief economist, Mark Gregory, who outlined that Newcastle United was responsible for £236m of the region’s GVA (gross value added) during the 2017/18 season. Supporter attendances at the stadium topped one million last season, including 190,000 visits to matches by people from outside the North East, which generated an aggregate spend of £21m. One-off events held at the stadium have also boosted the region and its tourism industry significantly. Hosting Rugby World Cup 2015 fixtures, Ed Sheeran concerts, the Great North Family Expo and just one of four Magic Weekends has contributed £52m GVA to Tyneside and surrounding areas. Newcastle United Foundation, meanwhile, continues to flourish, through its award- winning, life-changing community projects. Investing £3.2m in delivering its programmes during 2017/18, it generated £22.5m in community value – an impressive ratio of £7 in social impact for every £1 invested. Since being launched a decade ago, demand for the Foundation’s projects has grown dramatically. Participant numbers have increased by 480% since its first year of operations in 2008/09. In 2017/18, attendances at its community projects topped 58,000 – with more than 27,000 individuals attending at least one programme event or course. During Thursday evening’s event, former Newcastle United striker and current Foundation patron, Shola Ameobi, took part in a forum to highlight the charity’s immense social contribution to the city in which he was raised. Ameobi’s childhood home stood just yards from St. James’ Park and he was a regular attendee at Murray House along with his siblings. Transforming the site will enable Newcastle United Foundation to grow even further, as well as regenerating an important part of the city’s West End. To find out more about Project Pitchside and how you can show your support, please visit nufoundation.org.uk/teamup. Fancy a flutter against Southampton?